Windows is unable to connect to the selected network. The network may no longer be in range. Please refresh the list of available networks, and try to connect again. WPA (Wi-Fi Protected Access) and WPA2 (RSN Robust Security Network or IEEE 802.11i-2004) is more secure encryption algorithm for wireless or WiFi network, especially WPA2, which introduces new AES-based algorithm, CCMP encryption which is considered fully secure. WPA2 certification is now mandatory for network devices to be certified by Wi-Fi Alliance as “Wi-Fi CERTIFIED”. The Windows XP (with or without SP1) system does work properly and connect perfectly to the wireless network if the router, WAP (wireless access point) is configured to enable and use WEP 64-bit/128-bit/225-bit security encryption, which is less secure than WPA2 and WPA. Beside, in Windows XP SP1 computer, the WPA encrypted wireless network can be connected without error too. The error only surface on pre-SP2 Windows XP on both WPA and WPA2 protocols, and WPA2 on Windows XP SP2. By default, Windows XP does not has native support for WPA in Windows XP (which only added via KB815485 WPA support patch and via Service Pack 2), and no native support for WPA2 until Windows XP SP3. 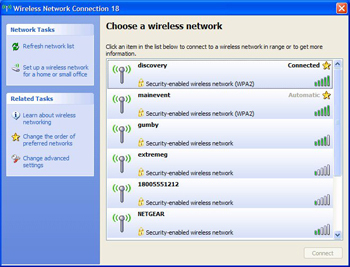 To verify that the unable or cannot connect to the wireless network is indeed cause by lack of support in Windows XP, right click on the Network Connections icon on the system tray (notification area), then go to Wireless Network tab. Select or manually add in the SSID for the wireless network, then click on Data Encryption option. If Windows XP supports WPA and WPA2, you will see its options appear in the drop-down list, in addition to usual WEP. To let Windows XP pre-SP2 system provides support for WPA WiFi network security encryption method, download and install KB815495 (KB article), or upgrade to Windows XP SP2. To provides operating system support for WPA2, download and install the newer KB917021 Wireless Client Update for Windows XP with Service Pack 2 (validation required at Microsoft Download Center, or user can direct download the WindowsXP-KB917021-v3-x86-ENU.exe) or older KB893357 Wi-Fi Protected Access 2 (WPA2) and Wireless Provisioning Services Information Element (WPS IE) update for Windows XP SP2 (validation required at Microsoft Download Center, or user can direct download the WindowsXP-KB893357-v2-x86-ENU.exe) or more recommended, upgrade to Windows XP SP3, which now incorporates the WPA2 hotfix and implements the WPA2 IEEE 802.11i wireless networking standard natively. After installing the WPA and/or WPA2 support into Windows XP and restarting the computer, if the system has a client wireless card with WPA/WPA2-capable firmware and WPA/WPA2 drivers, Wireless Zero Configuration (WZC) displays a WPA2 designation when user view the available wireless networks. For example, Security-enabled wireless network (WPA) and Security-enabled wireless network (WPA2), instead of just plain “Security-enabled wireless network”. As mentioned just now, operating system support for wireless security protocol especially WPA2 is just a piece of the jigsaw puzzle. The PC must also has client wireless card, or built-in wireless receiver, or Wi-Fi network adapter that supports WPA and WPA2. If you just bought the wireless network adapter recently, chance are the WLAN adapter will support WPA and WPA2 by default. If after installing the WPA2 (or WPA) update hotfix or latest service pack in Windows XP, yet WPA or WPA2 is still unsupported and system unable to connect to wireless network, check the website of the WLAN adapter or wireless card for any new updated WLAN driver that capable of enabling WPA and WPA2 functionality on the WiFi receiver adapter card. Some WLAN adapter may require a firmware update to support WPA and WPA2. If you have an old wireless card that the only option available is WEP, and has no updated driver for it, then WPA/WPA2 won’t work simply because the WLAN adapter does not support it. In this case, fallback to WEP encryption, or get a new wireless adapter.